In the early morning hours of December 22, 2008, the earthen wall of a containment pond at Tennessee’s Kingston Fossil Plant gave way. The breach released 1.3 million cubic meters (1.7 million cubic yards) of fly ash—a coal-combustion waste product captured and stored in wet form. As fly ash dries, it is typically moved to new containment areas to continue drying, and it was one of these areas, housing dredge cells that facilitate further drying, where the containment wall broke. Some of the sludge traveled north through a valley, and some flowed to the east, where it damaged dozens of homes. The spill infiltrated the Emory River, buried some 120 hectares (300 acres) in sludge, and even knocked a nearby home completely off its foundation. 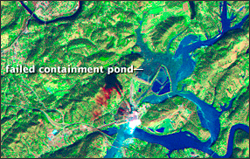 The Thematic Mapper on NASA’s Landsat 5 satellite captured the image above of the Kingston Fossil Plant and its surroundings on December 22, 2008, immediately after the spill. In the false-color image, water appears blue, and sediment-laden water appears light blue. Vegetation appears green, and bare ground and urbanized areas appear pinkish-brown. Light blue slurry covers the ground to the north and east of the plant. Sediment also clogs the nearby Emory River, evident from the waterway’s relatively light blue color. A report released by the Tennessee Valley Authority stated that the plant’s byproducts included arsenic, lead, chromium, manganese, and barium, although tests of drinking water upstream from the plant indicated that the water there was safe to drink. Estimates of the time required to clean up the spill ranged from weeks to years. Officials suspected that the breach occurred along the northwest corner of the northwest slurry pond. Representatives of the Tennessee Valley Authority cited heavy rains and freezing temperatures in the days leading up to the breach as factors in the incident. A preliminary report of a plant inspection conducted in October 2008 described a wet spot on one retaining wall that might be associated with a leak. The U.S. Senate Environment and Public Works Committee scheduled a hearing on the spill for January 2009.